I’m a whisky writer today. I wasn’t when you read my last post. I was a maturing malt spirit writer; an aged eau de vie hack. 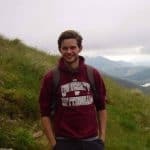 But since I wrote my first post on the 20thof July 2015, the Earth has racked up three laps of the sun plus a day’s gratuity, so today I’m a whisky writer. Or rather I’m a whisky blogger, but that’s really just a semantic argument for professionals worried their soapbox is getting crowded. Our squiggles all look the same in Times New Roman. A lot can happen in the time it takes to become whisky. UK whisky, anyway – you could technically ‘mature’ legal bourbon by filling a cask, rolling it to the bottle hall, and dumping the whiskey there and then. But in the UK it takes 1096 days, and that’s a long time. Enough time for England to lose to Iceland in the Euros and reach the semi-finals of the World Cup. For my friend’s daughter to be born, crawl, walk, laugh, speak and become a big sister. Enough time to complete a degree, an apprenticeship, a diploma or a really fiendish jigsaw puzzle. Enough time to write a book, if you can be bothered. It is probably enough time to read this. And for all that slow percolation of time, the new-make spirit gestates and pupates and ameliorates and inhales and gasps its vaporous breath into fusty dunnage murk. And not until the last of the ninety-four-million-six-hundred-and-twenty-nine-thousand-six-hundred seconds has slipped through the hourglass’s waist does it become whisky. Time is whisky’s central tenet. It is made from cereal and shaped by yeast, copper and oak, but time is whisky’s chiefest and most finicky determinant. Age too long and it becomes an overworked morass of tannin and splinter. Not long enough, and your whisky is a prickly, vicious, acetoned adolescent. 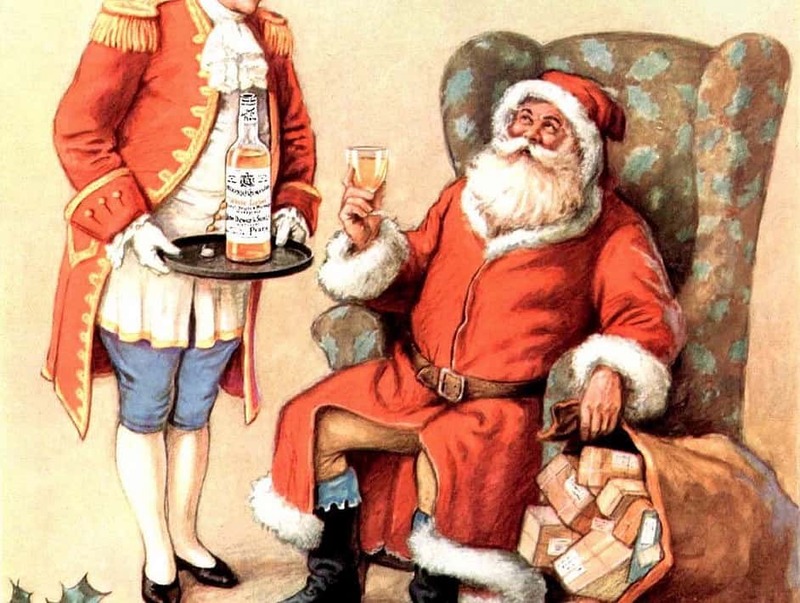 But time is whisky’s wonder and mystique too, and there’s where marketers’ eyes are set a-gleaming. In the spider-thread from lip to glass to misty, nostalgic rose-tint and soft sepia. Almost nothing else that we eat or drink can link us so directly and irrefutably to the past. It is liquid archaeology; time travel made potable. To taste whisky is to uncover the lost photo album; to sift through foggy, cherry-picked reminiscences; to will oneself to believe incongruously in a better and less heavy yesterday. Time is the awe and romance of whisky, so when back-label blurbs tell us stories of time, we believe them. They tell us older equals better. It doesn’t. They tell us things have always been done the same handed-down way. They haven’t. They tell us casks slumber undisturbed. They don’t. They tell us that local air breathes its own character on the spirit as it sleeps. That isn’t true either. Taste more than a handful of whiskies and you strip away the age lie. There are fabulous whiskies with the dew still on them, and creaking venerables that died in oak long before they saw glass. Methods, equipment, styles and ingredients have morphed and shifted like scudding clouds through decades of flux and uncertainty. Casks are hauled from warehouse to warehouse, island to mainland. You can’t extract flavour from air. So much of the dialogue around whisky is overblown romance, and none more than the fabrication that surrounds time. “The tyranny of the age statement,” as Mark Reynier once said. But then we always romanticise time and the past. As our memories are sieved and racked and muddled with the sprauchle of age, so the summers of yesteryear seem longer and sunnier, the countryside greener, laughs heartier, food tastier, evenings warmer and Christmases more flecked with silvery snow. We cling willingly to the falsity of a better once-upon-a-time like waifs around stuttering coals. And we shut out and censor that which was sad or bitter or ploddingly mundane. The dimmer the memory, the greater the reverence. The older the whisky, the deeper the apotheosis. Behind the myths and the tweakings of whimsy however, there is a romance – physical and demonstrable – to time’s impact upon the liquid in your glass. It is the unifying process. The slow-cook. The wool that binds together grain and yeast and still and wood and knits them into a single whole. It is the aching creep of evaporation and reduction and extraction and oxidation. 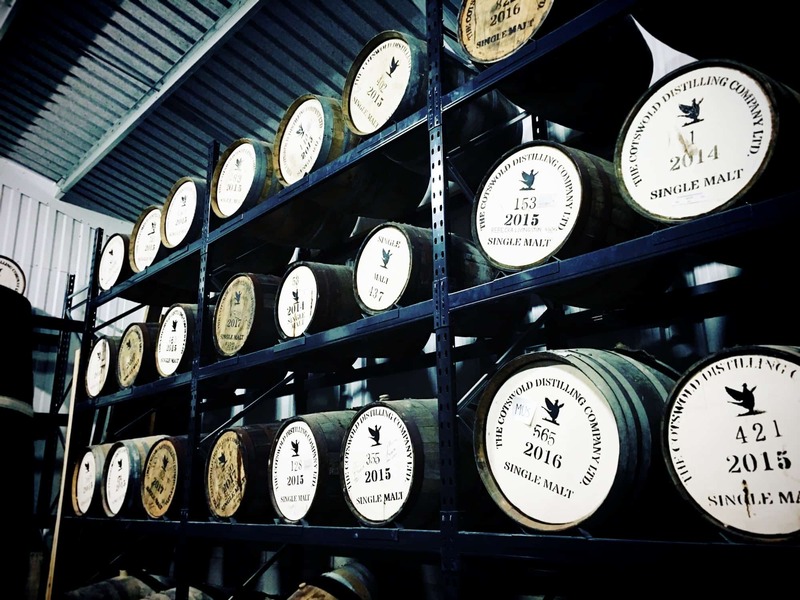 It is different for every barrel in every warehouse at every distillery in the world. It is what makes whisky, whisky, and not grain spirit. It is tastable and tangible and it is real. But it is also complex and difficult and poorly understood, and so all the benefits of time are distilled down to one digestible number on a bottle; adrift from context and relevance. And the customer buys the whisky that is twelve years old because they believe it will be better than the whisky that is ten years old, and perhaps they think about 2006 as they sip, and tell themselves stories of faux-better, edited days. And the whiskies in their warehouse barrels creep on: evaporating, reducing, extracting, oxidizing, and all that we hear about are far-away bodegas and train stations in Speyside. By all means think of the past through your glass’s prism. By all means think of the state of the world then; what was happening when your spirit was committed to barrel; what you were doing, and who with; whether you had even been born. That is part of whisky’s fascination and its joy. But remember, through your amber-tinted spectacles, that whisky does not “slumber” in its cask. Does not come out of a sherry cask tasting of sherry, or a bourbon cask tasting of bourbon. That the spirit beneath its layers of oak does not taste as it did when poured into barrel. That your whisky tastes different than it would have done had its constituent parts been drawn on any other day. That a visible, palpable alchemy has taken place. That time, and age, in the right context, told in the proper way, are not just numbers after all. Today’s whisky is at the younger end of the time spectrum. 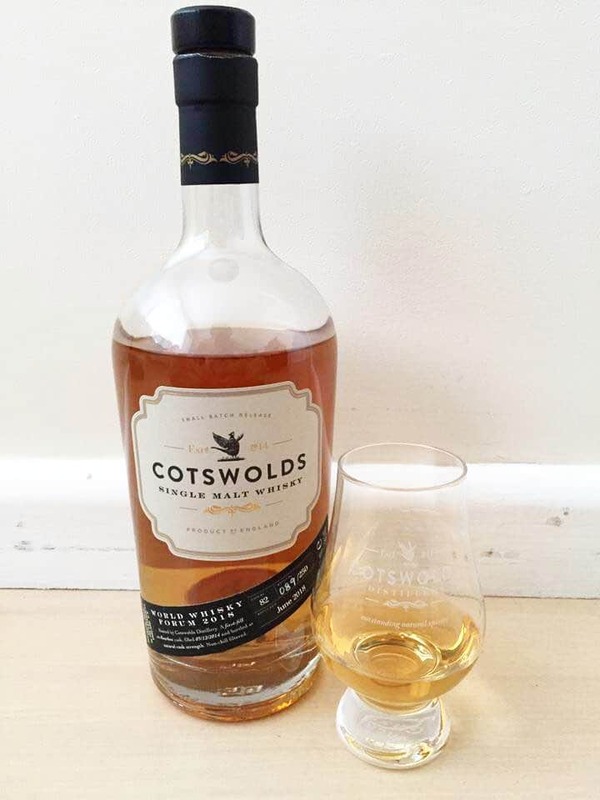 It’s a single cask from The Cotswolds Distillery, drawn from bourbon barrel #82 for their hosting of The World Whisky Forum. It’s cask strength – clocking in at 60.5%. 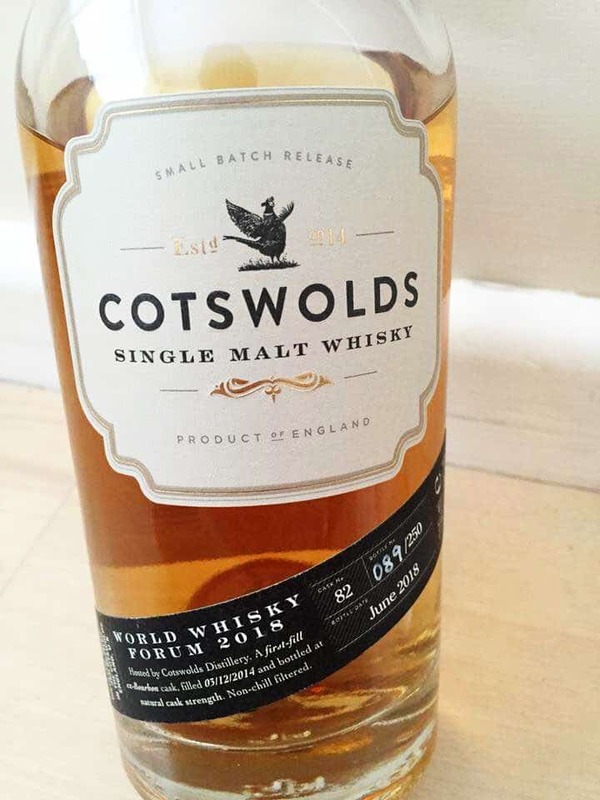 At the time of bottling it was the oldest stock the Cotswolds had – distilled on 3rd December, 2014. I gather it’ll be on sale from the distillery at some point (apparently it has to be, as they’ve given Jim Murray a sample, and he wouldn’t review it otherwise). As to when, or what it’ll cost, your guess is as good as mine. I’ll keep you posted. On the nose: Light, and redolent of late spring or early summer. Vanilla and cream. Actually, the centre of a custard cream biscuit. With a little of the biscuit itself. The Cotswoldian fruity signature is here: damson and greengage. Perhaps a light peachiness too. A smattering of maltiness. The booze is pretty feisty, as you’d expect from the age and proof. In the mouth: Christ that’s oily. Insanely so – this is properly viscous. That does something to envelop the booze, but there’s no accounting for 60.5% at less than four years old. This is a fiery mouthful, and no mistake. There’s less fruit than there was on the nose. More of the vanilla and biscuitiness. A dab of fresh cream and a touch of oatcake. Much more malty than the nose was. Without the influence of the flagship’s signature STR casks, the youth of the distillate expresses itself a good bit more fiercely. I think, on the whole, that it’s a little too young. I’d be fascinated to taste it at twice its age. That said, the DNA of the distillery shows through beautifully; another wonderful riff on their classic orchard fruit. 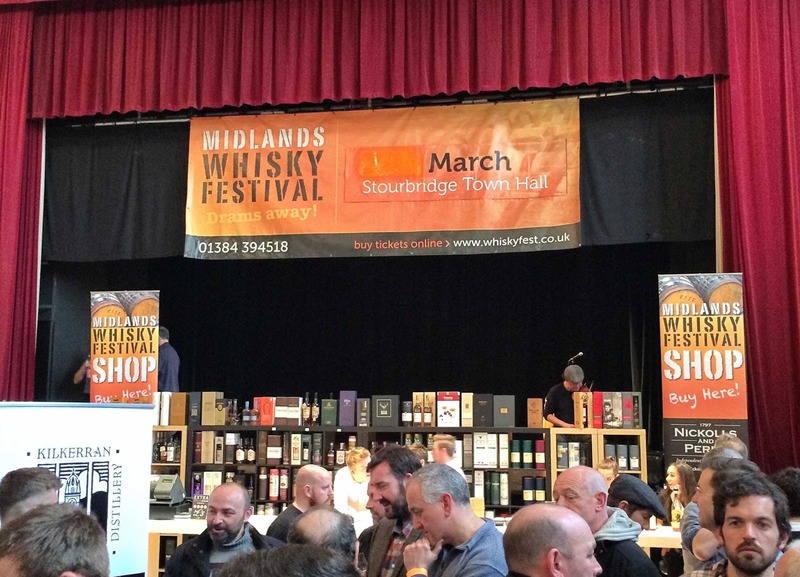 It isn’t a “drop everything and drive to Shipston-on-Stour right now” whisky, but there’s plenty of interest for their (many) fans. Another swaggering statement of the quality of their spirit. Anyway. Adolescent, vicious, needs a little more time to develop? At least today the symbolism’s apposite. Full disclosure: I got a bottle of this for being at the Forum. But if I marked stuff up just because it was free, Mark and Jason would shut me in the Malt Review Cask of Correction for a week.